Dreaming of a white Christmas? Then get the heck out of California! (Well, Southern California anyway.) But if you want some holiday hoopla along with some theme park fun, you've come to the right place. (Actually, quite a few parks offer “snow”—or at least the theme park version of it—to simulate a white Christmas.) All of the major parks offer events for the holidays. Let's run them down alphabetically, by park. 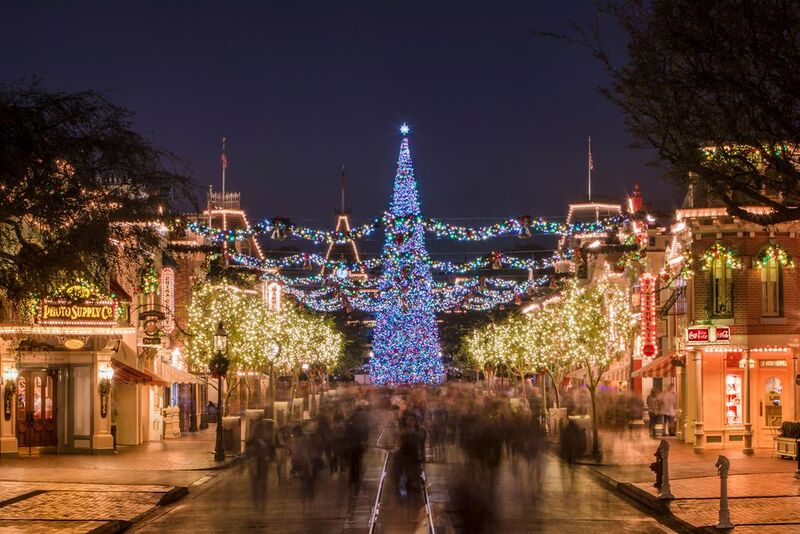 Both Disneyland and Disney California Adventure will deck their parks with holiday finery and special events. Highlights include A Christmas Fantasy Parade, Believe...In Holiday Magic Fireworks Spectacular, “it's a small world” Holiday, and Haunted Mansion holiday at Disneyland. Disney California Adventure will present Mater’s Jingle Jamboree, Luigi's Joy to the Whirl, a Festive Foods marketplace, and Disney ¡Viva Navidad! Highlights will include the ice show, "Merry Christmas, Snoopy," a Christmas Crafts Village with artisans plying their trades, snow falling in Ghost Town, the stage shows, "A Christmas Carol," "The Gift of the Magi," and "A Peanuts Guide to Christmas,” the Calico Carolers, the Calico Saloon Christmas Show, Santa’s Christmas Cabin, and the Snow and Glow Show. The park will be offering two holiday stage shows, “The Yuletides” and Lego Friends Holiday Show.” Legoland will will also be lighting its unique Christmas tree made entirely of Lego bricks, offering audiences with lego Santa and his Lego reindeer, and providing lots of holiday decorations, treats, and entertainment. The adjacent Sea Life aquarium will also be celebrating the holidays with a themed dive show, while the Legoland Hotel will get into the holiday spirit with entertainment and other features. The characters from the claymation TV classic, Rudolph the Red Nosed Reindeer will be at the park. The sea lions will join in the holiday fun with Clyde and Seamore's Christmas Special, and the dolphins presnt their own holiday show this year as well. Santa and Mrs. Claus will hold court in the park’s Christmas Village. The live nativity show, “O Wondrous Night,” will be presented. Among the highlights, thousands of lights will be synchronized to holiday tunes in Magic Mountain's DC Universe land. There will also be tons of twinkling lights, plenty of hot chocolate, and special holiday-themed shows. The park presents Christmas in The Wizarding World of Harry Potter with nightly snowfall and the dazzling projection show, “The Magic of Christmas at Hogwarts Castle.” There will also be a special presentation of the Holiday Frog Choir. Guests can also enjoy Grinchmas by meeting The Grinch, Cindy-Lou Who, Max the Dog, and other denizens of Whoville on the backlot original set of the Grinch movie. The cast will present a holiday show, “Martha May Who-vier and the Who-dolls.” There will also be a lighting ceremony for a Seussian tree.